The Karman 802-DY Lightweight Wheelchair features a breathable, flame retardant upholstery on a high strength black aluminum frame. 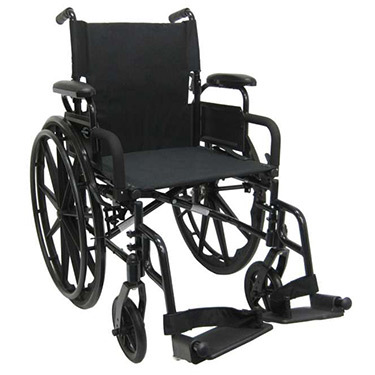 This wheelchair comes standard with detachable flip back armrests and adjustable length anti-slip footplates. 24" x 1" back wheels and 8" x 1" caster front wheels keep this chair rolling for miles. This chair also features push to lock wheel brakes and swing-away detachable footrests with heel-loops.